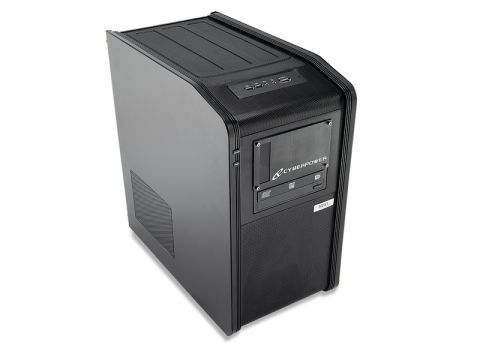 Sat inside this fairly non-descript, squat little case is one monster of a PC. Seriously, I've never wanted a pre-built computer more. Kudos to CyberPower, then, for bringing us a rig for under £2,000 that puts everything else we've tested previously to shame. And that's including machines costing well over a grand more. So what makes this jumble of silicon and wiring such a desirable beast? In short, CyberPower has made some astute choices in the make up of the unpronounceable Charybdis' componentry. The Bloomfield combo of the brand new Core i7 970 and fantastic Asus P6X58D-E motherboard gives you 12 threads of the most advanced CPU cores available. And thanks to CyberPower's water-cooling nouse, it's also upped the clocks from the (still pretty damned quick) 3.2GHz mark, right up over and above 4GHz. Sure, that's nearly £1,000-worth of processing power in itself, especially when you factor in the 6GB of DDR3 memory, so you'd be forgiven for thinking that to hit that sub-£2,000 price point you're going to be sacrificing some gaming performance. Well, kinda. CyberPower has opted for the cheapest 1GB GTX 460 currently on offer so that's almost a compromise, but then when you realise it's dumped two of them in there, and overclocked the pair, it's plain to see you're losing nothing in-game. As you can see from the SLI review, these Inno3D cards scale very nicely indeed, to the point where the previous multi-GPU combo of choice, twin HD 5870s, is now effectively redundant. And with that extra overclock on top this bargain GPU bundle can oust the big boys from the benchmark table. Seriously, when you can hit nigh-on 100fps at 2,560 x 1,600 in any modern game, you've got to stand up and take notice. The only real issue isn't anything to do with the rig's performance. It's in the thermal and aural areas that we have a few reservations. First off, it's loud. Because of the overclocked pairing of top-end CPU and SLI graphics cards, the little NZXT PanzerBox chassis has to work pretty hard to keep things cool in there. The CPU is water-cooled, but the large radiator still has two fans pushing air across it. There's also a chunky fan in the front that has a bit of the wind-tunnel about it. The heat of the graphics cards too is a cause for concern. The way the PCI-e slots are positioned means there's nothing in the way of clear air between them, and to compound matters, the warming presence of the PSU is pressed up against them thanks to the odd way the PanzerBox is laid out. Under load, the primary card tops the 80ºC mark, and the secondary can easily top 70ºC too. Over time, that might not do good things to the GPUs, especially with the Nvidia reference cooler doing the work. They'll probably still keep running long after DX11 is a footnote in history, though, so it's no biggie. £2,000 is a massive amount of cash to drop on a rig, especially one without a screen. But you get way more for your money than in systems asking more than a grand extra.